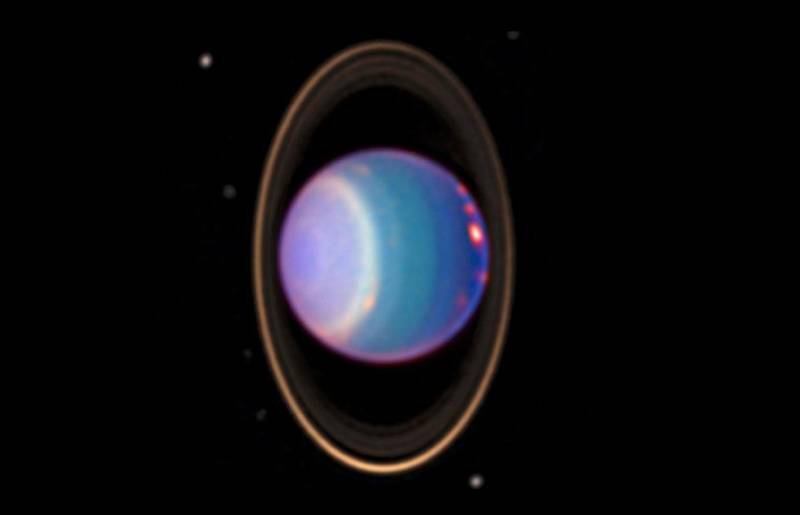 NASA, with participation by the European Space Agency, has just completed a concept study for a mission—or missions—to explore our solar system's least-understood planets, the distant "ice giants" Uranus and Neptune. Many of us grew up reading textbooks that described Uranus and Neptune as two of the four "gas giant" worlds of our solar system, along with Jupiter and Saturn. We were taught they were colder and smaller—and quite a bit bluer—than their two larger siblings, but were otherwise probably like them in composition and structure. But telescope observations from Earth, as well as the Voyager 2 data, have led scientists to suspect Uranus and Neptune may be fundamentally different from Jupiter and Saturn—different enough to have their own term: "ice giants." Scientists are hoping to learn more about how these planets and their moons formed long ago and, by extension, what conditions prevailed in the earliest times of the solar system's existence. Scientists piece together what the early solar system was like by studying planets, moons, asteroids, and comets as sites of forensic evidence. Every planet closer to the sun than Uranus—besides Earth, this includes Saturn, Jupiter, Mars, Venus, Mercury, and dwarf planet Ceres—has been explored with flyby missions and at least one long-term orbiter. To some of these planets we have sent atmospheric or surface-landing robots. We have even investigated the frozen time capsules called comets, which originate far beyond the realm of the ice giants and preserve pristine, undisturbed evidence of the solar system's earliest years. Even the dwarf planet Pluto and its moons yielded clues to those early times, when the New Horizons spacecraft grabbed a large batch of high quality data during its 2015 flyby encounter. But we have only a scant few hours' worth of up-close data for Uranus and Neptune. It was collected by a single spacecraft, Voyager 2, in 1986 and 1989. These planets' region of the solar system spans well over a billion miles, and we know relatively little about them. NASA's recent concept study examines aspects of a future mission. 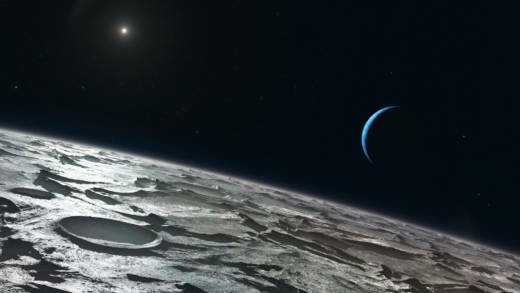 The study ranges from what scientific questions we want to answer about these worlds and their moons, to what type of instrumentation and spacecraft (flyby probe, orbiter, atmospheric probe, or combination of them) would best achieve those scientific goals, to possible technologies and trajectories for getting the spacecraft to their distant destinations. I recall the decade of discovery called the "Grand Tour" in the 1980s when Voyagers 1 and 2 made their way through the outer solar system, bringing us the first visions of its giant worlds and their moons. Only Voyager 2 went on to Uranus and Neptune, beaming back close, detailed pictures of those planets and their moons, where before we had seen only fuzzy balls and dots through Earth's largest telescopes. The Voyager 2 encounters gave us glimpses of methane-rich atmospheres, cloud formations, unusually shaped magnetic fields, and a large storm on Neptune dubbed the "Great Dark Spot." 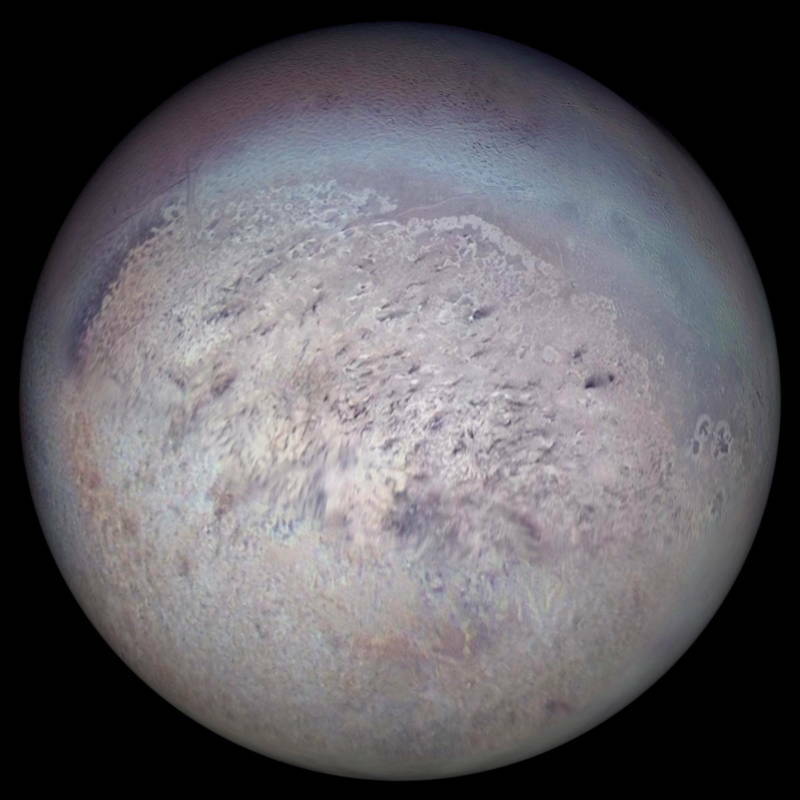 Voyager also showed us a variety of unexpectedly dynamic moons, including one—Neptune's large satellite, Triton—actively spewing plumes of nitrogen gas that fall as frost onto its surface. The name "ice giants" does not imply that Uranus and Neptune are made of ice, or even contain significant amounts of frozen material. It is a reference both to the frigidly cold region they dwell in, and the expectation that they are composed of materials like water and ammonia and methane—substances we find in frozen form on smaller bodies out there, such as their icy moons. 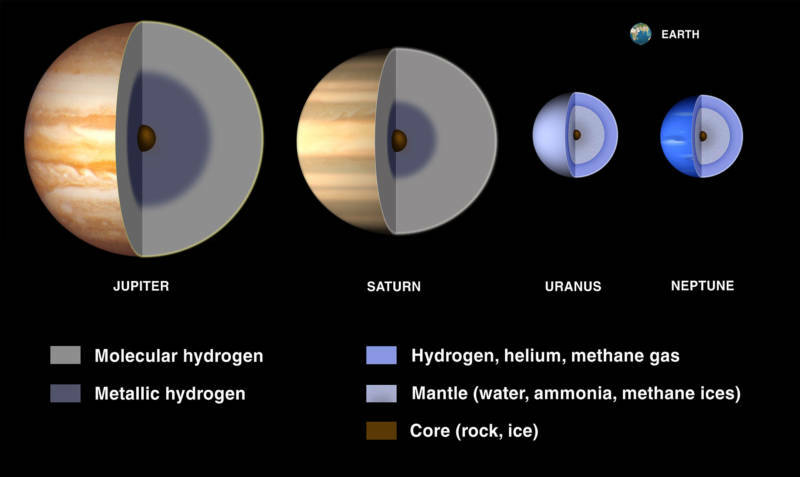 It is estimated that as much as 60 percent of an ice giant's mass consists of heavier materials like these—as compared to Jupiter and Saturn, where 85 percent of the gas giants' bulk is made up of lighter gases such as hydrogen and helium. It may even be that a huge liquid ocean accounting for as much as two-thirds of each ice giant's mass lies hidden beneath the upper cloud layers. Perhaps "liquid giant" would be a better term. A mission to either of these mysterious planets probably wouldn't get going until sometime in the next decade, with the actual flight to Uranus or Neptune taking several years. But if the thrilling rewards of Voyager 2's flybys three decades ago are any indication, it will be a mission well worth waiting for.